Santa Rosa was beautiful and smelled nice, a visitor from Kansas wrote; too bad the people were so awfully boring. That pretty much sums up a travel piece written by someone named E. W. Ellis that appeared in a 1909 Kansas paper. A reader clipped the article and sent it to a local relative, who passed it on to the Santa Rosa Republican for reprint. Essays like this are rare finds and absolute treasures. What did you see while wandering around town? What scents were in the air, what sounds did you hear? Some of what he wrote showed that he saw Santa Rosa as an exotic place: He was surprised to find no birds around, until he was told that the surrounding fruit orchards were in season. He found it unusual that “All the restaurant dishes are without seasoning, and the signs on the wall read: ‘Patrons please pay on delivery. '” He found it odd that women did not carry parasols, supposedly because it was thought that the westerly breezes prevented freckles. Much has appeared in the Kansas papers of the merits and demerits of California, and our people as a whole are fairly well acquainted with the climatic conditions and health-giving qualities of the state from San Francisco to the Mexico border, including of course, Los Angeles and the Santa Catalina Islands. But so far as the writer has observed the territory north of Oakland, Sacramento, and all along the western slopes of the grand old Sierra Nevadas has been touched upon but lightly and is a sealed book to the major portion of the easterners. 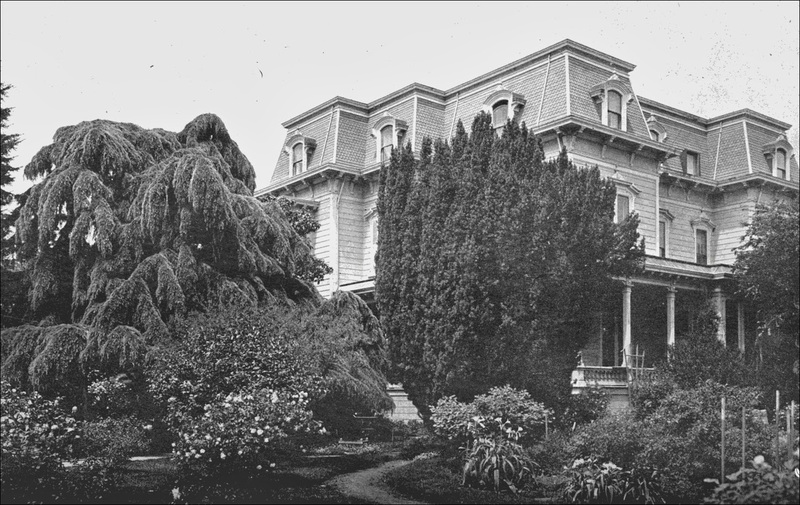 Of the counties visited “above the bay” none pleased the writer so well as Santa Rosa, a dreamy, hazy, habitation of 10,000 people who are living their lives away with little thought of the cares of today and none of the morrow. But with such beautiful surroundings of the low foothills thick with vineyards and blossoming orchards and beyond and higher up purplish hills covered with oak, through which the winds sing a drowsy requiem day after day, there is every excuse for a Rip Van Winkle existence. No rain has fallen in this portion of the country since early March, but the foliage, the vegetables and fruits seem as prosperous as if April and May showers had been frequent. This is due to the heavy fogs that come from the ocean once or twice a week, at night. The days are bright and warm while a fire in the evenings and mornings is really needed with comforters and blankets for the bed. April is the season of the year for “Easterners,” as they call Kansans here, to come to this country. Then the land is at its best and one can also witness the “Rose Carnival,” which is a feature of Santa Rosa yearly and is well worth seeing. As the name would indicate it is a city of roses, every yard and garden fence is covered with a mass of creeping vines that are pink, white, yellow and red with blossoms from the size of a clover bloom to a cabbage. Many of the houses, too, are hidden behind artistically trained bowers, so closely interwoven that a bird can scarcely find a nesting place. This makes such homes a dream of beauty, then again it saves paint, and oh, the sensuous perfume of the thousands of fragrant tropical roses, honeysuckle, carnations and other blooming plants which the fresh green smell of the pine and fir prevent from becoming sickening. To one direct from the prairies and just winding up a transcontinental trip, over which sage brush and alkali abounded, the country seemed a very paradise. The yards and lawns are the most beautiful imaginable. But why shouldn’t they be. With a productive soil, an abundance of water, a climate that is model and every person trying to outdo their neighbor there is little to prevent them from being perfect. In one yard I noticed a Cedar of Lebanon, imported from the Holy Land years ago and perhaps the only one in the state. As for broad spreading, lofty palms, calla lilies, ferns, Shasta daisies, sweet peas, magnolias, etc., the town is filled with them. One peculiar tree is the monkey tree. A sharp, thickly woven bark of thorns covers it, and it is said that it is the only tree a monkey will not climb. The citizens here do not seem to know, or appreciate, what a pretty town they have and that everything is out of the ordinary. To an “Easterner,” who is admiring the sights they only laugh and exclaim, “Oh, that’s nothing,” toss him an armful of roses and pass on. To me one of the prettiest flowers is the yellow poppy. It is California’s native flower, even as the sunflower is of Kansas. It is known as the cup of gold and is the state’s emblem. A half dozen little peculiarities are quickly noticeable to the visitor. First there are less than a dozen negroes in the town and they are members of the local churches and worship in common with the white people, being admirable citizens. Secondly, there are no birds. This seems strange with such a tropical vegetation, but it is explained that they have flown farther up the valley to the fruit lands where cherries are ripe. Thirdly, the ladies passing along the street carry no parasol. The soft sea breeze from the ocean, 20 miles away, they claim prevents freckles, and again, its too much trouble. Fourthly, motorneers on the electric lines are allowed to sit down at their work during the day. The service seems satisfactory. Fifthly, nonwithstanding this old Spanish town where hot tamales and chili would be expected to prevail, all the restaurant dishes are without seasoning, and the signs on the wall read: “Patrons please pay on delivery.” Sixth, nothing apparently had ever happened in this town prior to the earthquake of three years ago, although the town is a half hundred years old. The calamity was a severe one, whole blocks tumbling over and many being killed so “this and that” is always pointed out to the stranger as happening since the upheaval. This is a great bicycle town. Men, women and children ride wheels at all times and seasons, and they are experts, too. Santa Rosa has its Chinatown as well as San Francisco. A block of the city is devoted to the Celestials, and with a few roses and carnations within their walks to offset the odor of the garlick and other vile dishes, other portions of the city are preferable. The older Chinese are, as usual, dull appearing, stupid and unobserving, shuffling along about thir business in their native garb. The youngsters are a bright little lot, however, flitting along the sidewalk like the English sparrows. Being “native sons” they adopt the American clothes and costumes. They attend the city schools and prove themselves apt pupils. Santa Rosa has two water plants. One is a municipal affair, solely for the sprinkling of lawns and parking. Each family is allowed 10,000 gallons of water monthly, after that a charge is made. For drinking purposes and household use a private corporation with a reservoir far up in the foothills furnishes clear, sparkling water at a dollar a month. The Kansas writer is wrong in this. Three-fourths of the residents use municipal water for all purposes and it is pure and wholesome.–Ed. The schools too, are on firm basis, the high school drawing many pupils from the surrounding towns and valleys. But the pride of not only Santa Rosa but all California is Luther Burbank, the great scientist, who from childhood chose the plants for pets rather than animals. He came to this valley in 1875 and began his work of improving the old plants and creating new ones. Hundreds of new trees, flowers, fruits and grasses have sprung into being owing to his indomitable efforts. His greatest work is in providing a thornless cactus. This can be planted on the Arizona and New Mexico deserts, reclaiming the waste places and at the same time allowing man and beast to wander through without injury, the Burbank potato and green rose are other vegetable and plant creations. Jealous meddlers declare his paints for the roses and hired help to extract the thorns from the cactus have cost him a fortune. But as Carnegie donates him $10,000 a year, what’s the odds? He is also the creator of a seedless blackberry and is working on an odorless onion. His experimental grounds near the city is the yearly mecca of scientists from all over the country and indeed is a great curiosity shop. An eastern friend who had visited this country told me I would be eaten up by fleas. But the statement seems to have been of a maligning nature, as I went to church twice Sunday and had no occasion to “scratch” during either sermon. One thing they do have in plenty here, however, is chickens. Ranches surrounding the city nearly all have great flocks of them, while it is down at Petaluma the place is known as “Chickentown.” And almost in entirety the flocks are white leghorns, Plymouth Rocks and Buff Coachins being almost unknown. Two town curios I almost overlooked. One is a rose bush with 10,000 blooms from a vine with a 65 foot stump. Of course no one has counted the blossoms, but experts say that is a low estimate. It is owned by a modest resident and the bush is almost as large as the house. The other is the Baptist church which has the distinction of being the only church in the world built entirely from one tree. The tree came from the Sonoma county forests, and when sawed, yielded 78,000 feet of lumber. In addition there were three hundred shingles left over. The altitude of Santa Rosa is about 150 feet about the sea level and the surrounding hills protect it from the frosts, but still few oranges are raised. However, at Cloverdale 30 miles north, splendid oranges are grown and great crops of them. Several days ago in San Francisco a worthless cur dog rushed into a schoolhouse and severely bit three little pupils before the frantic animal was checked, taken to the city pound and killed. Cannot we accept that instance as a lesson? In Santa Rosa there are hundreds of tagless, worthless and often half-starved dogs, and the nuisance is growing. They prowl nightly through back yards for food and round in school yards may be seen daily these hungry animals, eagerly seeking the scraps of lunch thrown away by the pupils. There is a city ordinance requiring that a license be paid on dogs, but only the owners of the few valuable dogs here pay the license, or pay any attention to it. That seems like an inducement to own a worthless dog. A raid should be made on every tagless cur until the streets are clear. Of course, a dog pound cannot be made self-supporting, for only a few people sufficiently value their unlicensed dogs to pay for their redemption, consequently the pound man would be left with a pen of curs on his hands. Would it not be well for the city council to take notice? SUBSCRIBER. 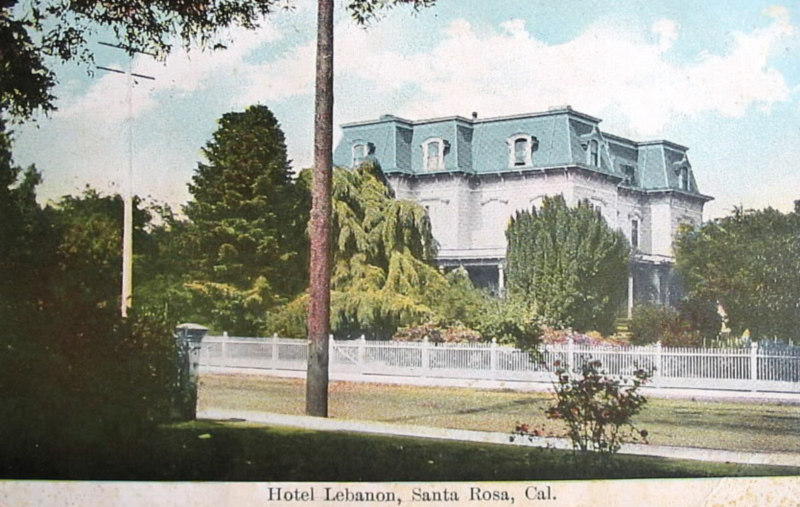 “Rose trees” were popular in the West during the early 20th century, and every postcard vendor usually has a selection of photos from several cities. Santa Rosa had a couple of rose trees, one climbing to sixty feet, as seen to the right (CLICK on image to enlarge). Obl Believe-it-or-Not factoid: The world’s oldest rose tree is the 125-year-old Lady Banksia in Tombstone Arizona, which covers almost 9,000 square feet. 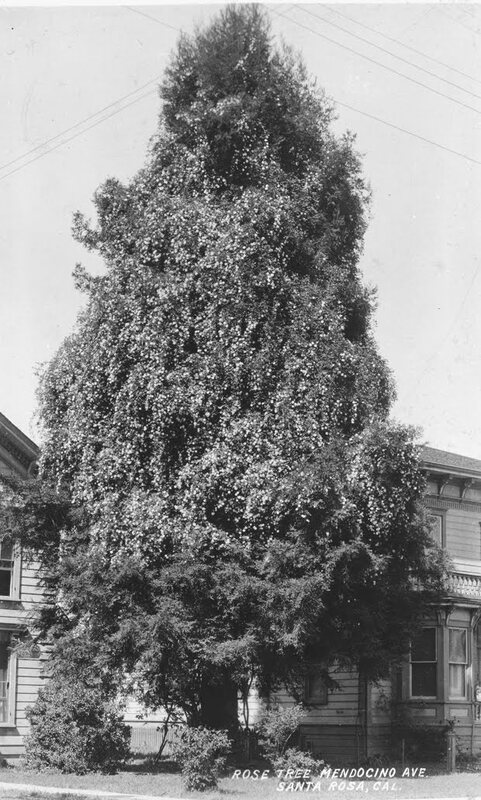 In the yard of the old Claypool residence on Mendocino street, just off Fifth, there is a rose bush which has climbed a massive tree to a height of more than sixty feet. Just at the present time the bush is filled with thousands of white roses and makes an interesting appearance. Hundreds of people pass the scene daily and admire it. To the north of the rose tree is a two story house, and the rose bush towers fifteen feet above this residence, which is about forty-five feet high. A photo of the rose bush showing its relative height in that of the two story structure would be interesting to use in advertising matter of the City of Roses. The beauty of the “City of Roses” at the present time with so many flowers in bloom is attracting much attention from visitors. While there are many attractive sights in a floral way to be found in all parts of the city, one of the most unique is a monster bouquet of roses at the home of W. R. Smith, the well known pioneer at E and Second streets. An old locust tree was cut off about fifteen feet from the ground, and about the trunk ivy has been trained until nothing can be seen of the stump. Several climbing roses have grown into the ivy vines and thrown their branches out in all directions until the top is fully sixty feet in circumference, and this is now a mass of white, red and pink rose blooms. The effect is a perfect bouquet of immense size. A number of photographs have been taken and the pictures will be preserved.